Thank you for visiting Indonesian Journal of Pharmacy (ISSN-e: 2338-9486, ISSN-p: 2338-9427), formerly Majalah Farmasi Indonesia (ISSN: 0126-1037). The journal had been established in 1972, and online publication was begun in 2008. 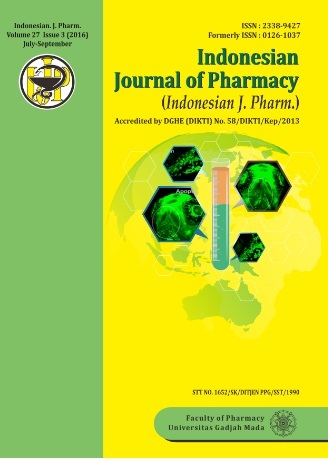 Since 2012, the journal has been published in English by Faculty of Pharmacy Universitas Gadjah Mada (UGM) Yogyakarta Indonesia in collaboration with IAI (Ikatan Apoteker Indonesia or Indonesian Pharmacist Association) and only receives manuscripts in English. Indonesian Journal of Pharmacy is Accredited by Directorate General of Higher Education (DGHE) DIKTI No. 58/DIKTI/Kep/2013. Since 2018 start form Vol 29 Issue 1 Indonesian Journal of Pharmacy has been indexed by Scopus. Therefore in order to maintain quality and timely publication, any accepted manuscript for publication which had been submitted after January, 1st 2019 will be charged for USD 100 per manuscript as the Publication Fee. Article(s) with colored Figures or Graphs will be charged for additional fee as much as USD 50 for each page with an agreement between the Author and the Editors.